Are your tiling chainmail textures not looking quite right? Individual links large enough for a ballista bolt to pass through? Or perhaps the links are so tiny that your coat-of-mail is more like a gossamer veil? You need an easy way to adjust the amount of tiling and set the individual links to the perfect size for that destrier barding, chain mail bikini, or whatever. This script was created to go with my 'tileable mail textures' freebies (also available here at ShareCG), but will work with any Image_Map node based tiling texture. The script will change the U_Scale and V_Scale parameters on every Image_Map node of every material in the currently selected figure or actor, or just the selected material. 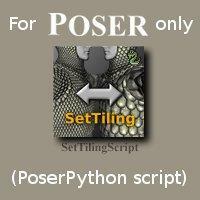 There are several Poser dialogues when you run the script to ensure that you only change the materials you intended to. See the other two pictures for more information (and of course the readme after you've downloaded). Tested in Poser 6 on a Windows 7 system, but should work on other variations. Thanks! This sounds very useful, I'll give it a try! Chaosophia (7 years ago) Inappropriate? would love to see other python scripts - always handy! - thank you so much! If I had your brains I would have thought of this.